Every story tries to reveal the kind of story it is from the opening page or opening shot, in the case of film and TV. The opening shots of any given episode of Breaking Bad, for instance, are pretty different from the opening of any episode of Parks and Recreation. One is almost always foreboding and dark, and the other is light, fast, and witty. Even if you were to encounter these shows with no knowledge of them, you’d understand after about five seconds what kind of world and narrative sensibility you’d entered. 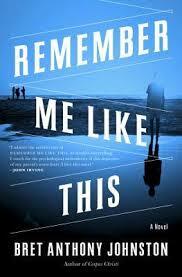 Novels and stories must set the mood as quickly as any TV show, and a great example is the beginning (or pretty much any chapter) of Bret Anthony Johnston’s debut novel Remember Me Like This. The book is set on the Texas coast, in and around Mustang Island, a place that can inspire many emotions. But the novel quickly focuses on a specific mixture of them that hints at the story to come. You can read an excerpt at the Random House website. Months earlier, the June heat on Mustang Island was gauzy and glomming. The sky hung close, pale as caliche, and the small played-out waves were dragging in the briny, pungent scent of seaweed. On the beach, people tried holding out for a breeze from the Gulf, but when the gusts blew ashore, they were humid and harsh, kicking up sand that stung like wasps. By midday, everyone surrendered. Fishermen cut bait, surfers packed in their boards. Even the notoriously dogged sunbathers shook out their long towels and draped them over the seats in their cars, the leather and vinyl scalding. Lines for the ferry stretched for half an hour, though it could seem days before the dashboard vents were pushing in cool air. Porpoises wheeled in the boats’ wakes, their bellies pink and glistening. You may have paused at these words and phrases: gauzy, glomming, close, pale as caliche, played-out, dragging, holding out, humid and harsh, stung like wasps, surrendered, cut bait, dogged, scalding. And, of course, there’s the static image of the cars lined up, waiting for the ferry. Taken together, the words don’t describe a particular emotion so much as a general sense of an end of things. If this was a film, it might be called a tone poem: the mood is unmistakable. As readers, we’re made uneasy. And then there’s that last line: “Porpoises wheeled in the boats’ wakes, their bellies pink and glistening.” Its tone is markedly different, even the opposite of everything that came before it. It might be tempting, if reading this in a workshop, to suggest cutting the sentence. But, in fact, it might be the most important line in the paragraph. It’s the postcard from Hawaii taped to the bathroom mirror in a Chicago apartment in February—the reminder, good or bad, that there are other ways of being and other perspectives on the world. Placing this bright line in a dreary description makes the dreariness even harder to bear. It also suggests that there are entities in the world that relish conditions that the rest of us find unbearable. Choose the place to describe. Be specific. Johnston shows us a particular spot on the beach. In the prologue, he focuses on the Harbor Bridge in Corpus Christi. Choose the moment to describe it. Descriptions tend to focus on moments of transition. So, Johnston shows us the beach as the weather is driving the surfers, fishermen, and sunbathers away. The bridge in the prologue is shown at its beginning and then in the moments before and after a group of people walking over discover something terrible. So, think about what often happens in the place you’ve chosen. Or think about an incident that occurs there in your story. Describe the place just before or after that moment has occurred. Choose a narrative arc. Think of the description as a story, with a beginning, middle, and end. For instance, Johnston begins with the weather conditions, which drive the people away, who then sit in line for the ferry while the porpoises swim. In other words, the end of the description should be different from the beginning: a narrative arc, no matter how small, is a way to ensure this. Write the description. Keep all of the above in mind: the moment of transition, the arc, the mood. After each phrase or sentence, take a look back at the nouns, verbs, and adjectives in it and ask yourself if they can be changed to fit the mood. Play around with the diction. In Johnston’s paragraph, the difference between “small waves” and “small played-out waves” is small but significant. That difference is the source of much of the pleasure in writing. Challenge yourself to lean toward the mood at every opportunity. If you lean too far, you can always pull back. It’s possible that these steps may seem overwhelming. You might wonder if Johnston approached the paragraph in this way or if he simply wrote it. The odds are, he just wrote it, and perhaps you will, too. But one drawback to modeling your work after published writing is that you’re trying to achieve the same effect as someone who’s been working for many years. As beginners, we must sometimes parse out the processes that more experienced artists seem to manage naturally, without thinking. So, give yourself permission to scramble these steps, to forget some or focus more heavily on others. Let yourself experiment. You’re giving your imagination room to work. wow. super helpful. Thank you for posting this! Good exercise. I especially liked the counsel at the end, about modeling writing after accomplished writers. Experimentation can be play, too.